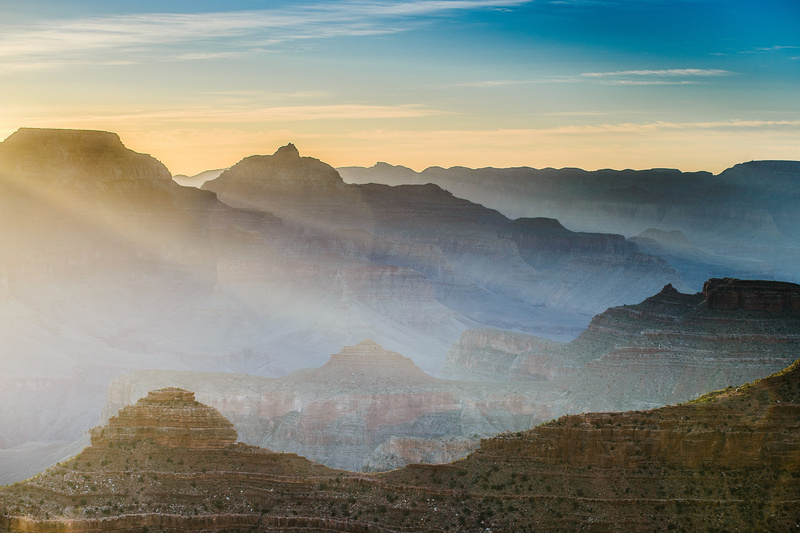 I love the Grand Canyon, when you first look at it the scenery almost looks fake like a painted back drop is being draped over everyone eyes. It is absolutely incredible. The first time I went to the Grand Canyon I said the only way I am going there is if I can hike it, and it has been the same ever since. A group of friends decided we should trek up on a Saturday, out of the phoenix July heat, do a little sightseeing, camp for the night, and enjoy the views. 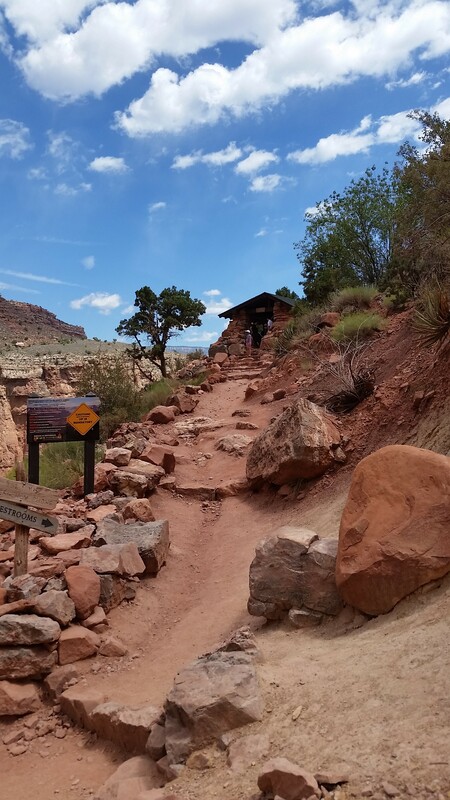 I opted to use Sunday as a chance to hike to the river and back by diving down South Kaibab trail, touching the Colorado River, refueling at Phantom Ranch, and ascending back out via Bright Angel Trail. 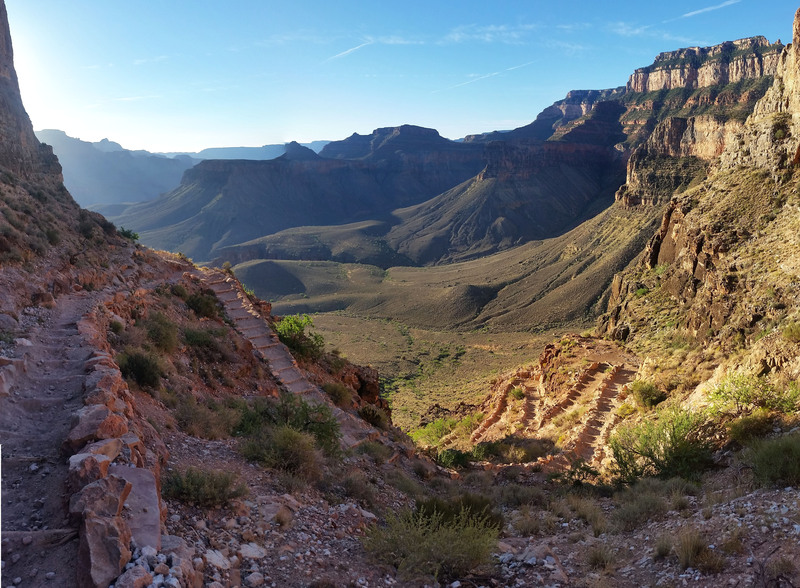 We packed into the car and headed for the South Kaibab trailhead, I was giddy on the inside like a kid waking up on Christmas morning. I was so excited to start! Paul dropped me off and headed to another point in the canyon to take photos of the sunrise. I strapped on my back grabbed my trekking poles and dove in! There is something about descending into the canyon with little usable morning light, watching the sun rise, that is just indescribable. I snapped pictures so much I left like a tourist seeing it for the first time! I bombed down only seeing a few people on the trail. Phantom ranch was supposed to reach a high of 104 that day so I could see how many people weren’t on the way down. The temps began to rise with the sun as I descended, I chatted with a few people that I saw along the way. 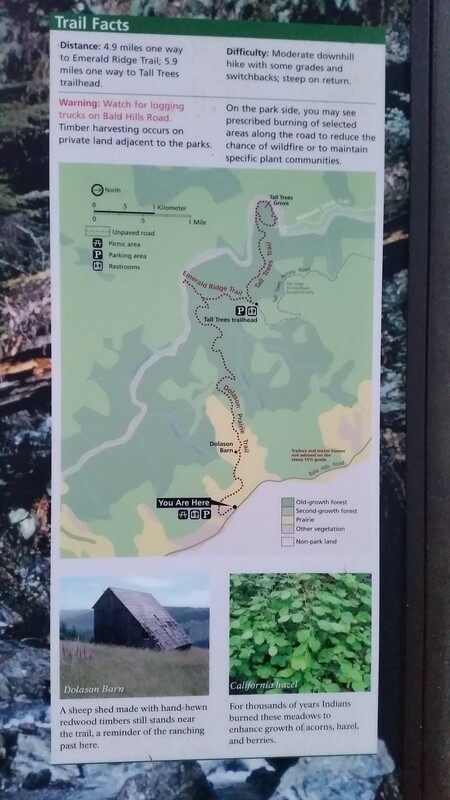 It was really nice to have the trail to myself, just listen to the canyon walls, the rocks, and the wildlife. Sometimes it’s just nice to “Speak less, Listen more” – Paul Torgersen. The bridge came in sight and I crossed paths with a mule train ascending from the bottom. I snapped a pic, said hello, and kept trekking. I knew that the longer I stayed in the bottom the hotter it would become and the more treacherous my 16 mile journey would become. 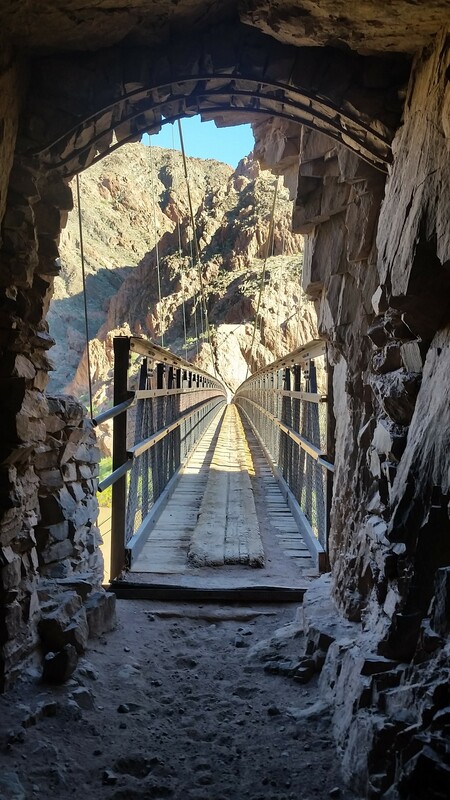 I hurried across the bridge and onto Phantom Ranch, pausing to snap a few pictures along the way. The cactus were bearing prickly pears, the Colorado River was murky mud brown, and the sun was beginning to bear down; truly glad to see evey bit of it! 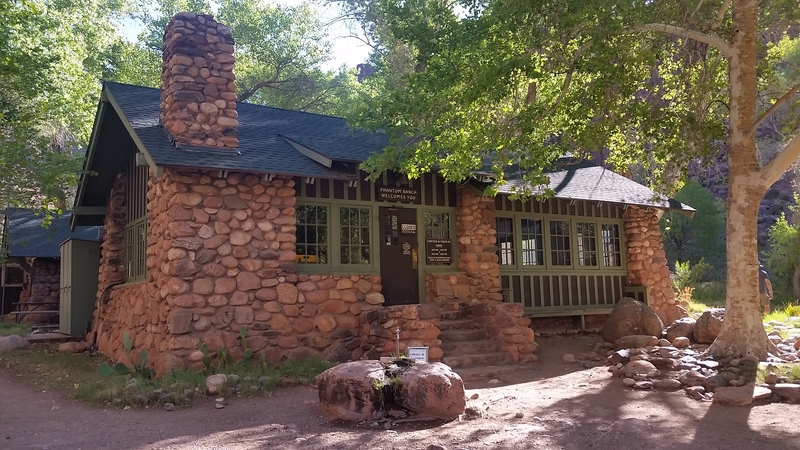 I turned up North Kaibab to touch off at the Phantom Ranch for a quick snack and to refill my water. I kicked my feet up just outside the store as I munched on my bag of quinoa and lentils (I’m trying to eat a little better on the trail these days) amongst other assorted nuts, protein bars, and a few pizza flavored Pringles chips (shhh . . . its fine). After the rest I walked inside because I heard you could send post cards from the bottom of the canyon. I located the postcards for sale, paid for 2 postcards (PLUS postage), quickly wrote a note to some good people (you know who you are), put them in the leather satchel on the wall and headed out the door back to the trail. Refueled and ready for the 9 mile, 4,600 ft of gain trek out of the canyon, I quickly clicked on. The Bright Angel creek next to the trail was flowing nicely and cooled off the side canyon. 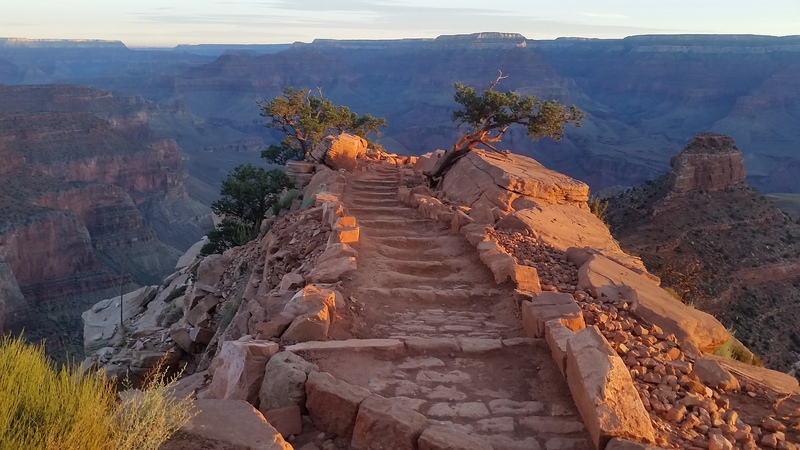 Before long I was already past the second bright back on the south rim side on the Bright Angel Trail, trekking through the slow sand, waiting to turn north into the Devils Corkscrew. The call it the Devils corkscrew because the ascending switchbacks are usually traversed in the sun and you get baked, no cover in sight. Once past the corkscrew I was rewarded with my first views of Garden Creek flowing nicely noting the end of the corkscrew and making my spirits a little better under the baking sun. It was in the 90s by now and I slogged into Indian Gardens before plopping down for a nice rest. Indian Gardens is a green lush mirage just off Gardens creek down in the canyon. A mix of Cotton wood trees, bushes and cacti stood along the Creekside making the watering hole a nice place to rest. After kicking my feet up and fighting off extremely persistent squirrels after my snacks I pressed on. The last 4.5 miles of this journey is always the toughest of the trek. Big gain in a short distance, under the sun, and at the tail end of the long tiring slog. I cranked on, found my stride, and kept pushing onward. Only a few miles left, cant stop now! I only paused for a few pictures of the gorgeous blue sky on the way out and a quick drip of my handkerchief under the spigot at the 1.5 mile house. Before I knew it I passed under the first rock arch and soon turned up the last switchback. 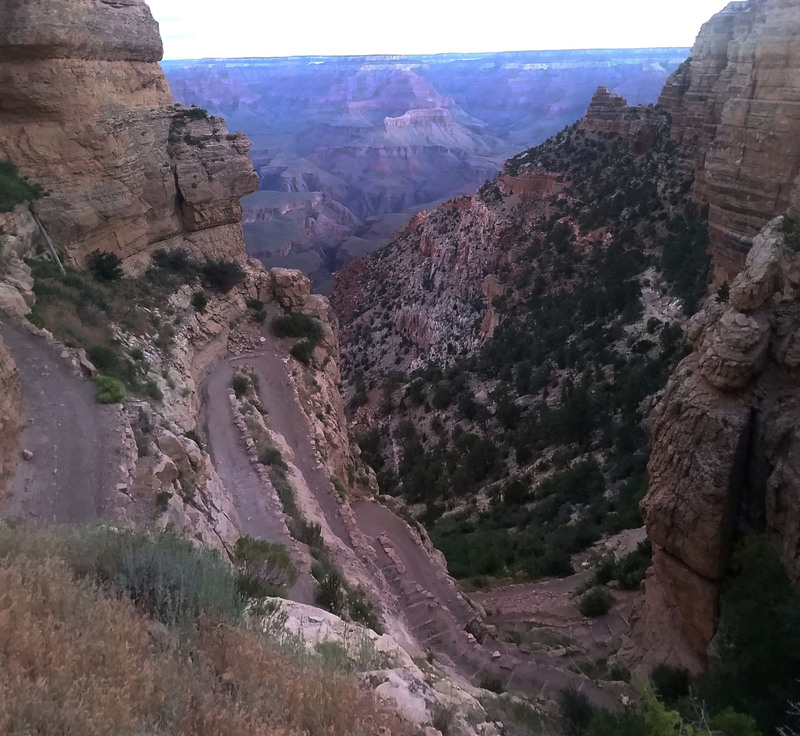 I refused to look up towards the rim the entire push out, until the last switchback when I could see Kolb Studio, and then I knew I had made it. That giddy feeling I got from the first step on trial came over me once again, I knew there were only steps away from finishing. I walked out to the Bright Angel Lodge, bought a Gatorade and took my boots off for a much needed rest. What a gorgeous day, couldn’t ask for much more than that! There is the Kolb Studio, last switchback! Lets hang out here . . . . sounds like a great spot . . .
Indian Garden here I come! OOOooOOOo waterfalls in the desert? Why not? !